Jaguar’s E-type Zero, now production-bound. Photos courtesy Jaguar Land Rover. Last September, Jaguar debuted a concept car it called the E-type Zero, which swapped a 1968 E-type Series 1.5 roadster’s original 4.2-liter six-cylinder engine and transmission for a 40 kilowatt-hour lithium-ion battery pack and a 220-kilowatt electric motor. Based upon overwhelmingly positive public reaction, Jaguar has announced plans to build electric E-types from original cars, run through the same Coventry facility as its E-type Reborn models. It’s not entirely clear if the electric E-types will be restored to the same standard as E-type Reborn cars, which are concours-quality and priced accordingly (£285,000, or $355,000, in April 2017). The Reborn program focuses on Series 1 (and 1.5) E-type roadsters and coupes, built between 1961 and ’68, and begins with solid donor cars sourced by Jaguar’s in-house experts. It appears that Jaguar will offer both roadsters and coupes with electric power, though this has yet to be clearly defined. Once ready for the conversion, the restored cars will receive a lithium-ion battery pack of roughly the same size and weight as the E-type’s 3.8- or 4.2-liter six-cylinder engine, mated to an electric motor positioned in approximately the same position as the transmission, not needed with an electric motor (which uses a single-speed reduction gear). If the production electric E-types remain true to the E-type Zero concept, the final weight will be about 100 pounds less than a gasoline-powered car, meaning that changes to the original suspension and brakes will not be needed. 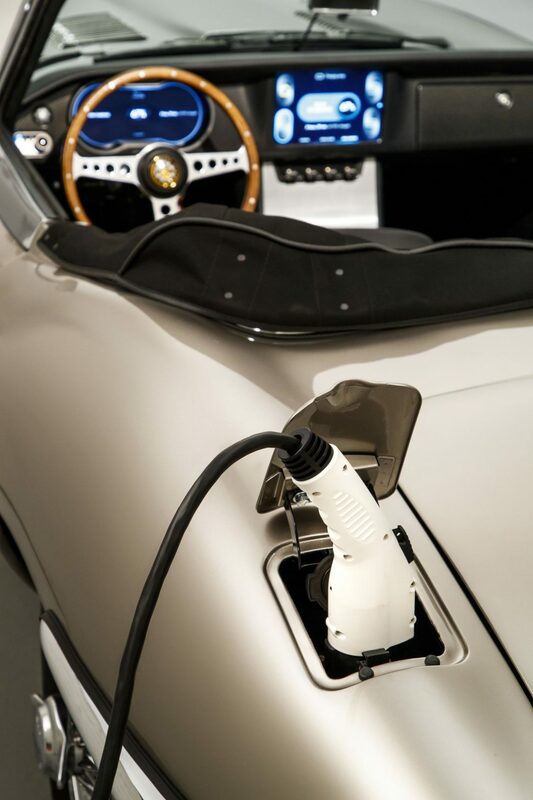 Jaguar opted for a 220-kW (roughly 295-horsepower) electric motor in its E-type Zero concept car, in part because it retained performance comparable to the original internal combustion version. Though not yet finalized, it’s likely Jaguar will use a similar motor for the production version, since retaining the E-type’s balance, handling and ride quality was a stated design goal. Jaguar is aiming for a real-world range of “over” 170 miles, thanks in part to power management technology developed for its I-PACE all-wheel-drive electric crossover. Designed as a pure electric vehicle from the ground up, the I-PACE claims to deliver a range of 240 miles (thanks in part to its larger 90 kWh battery pack), combined with a 0-60 mph time under 5 seconds. 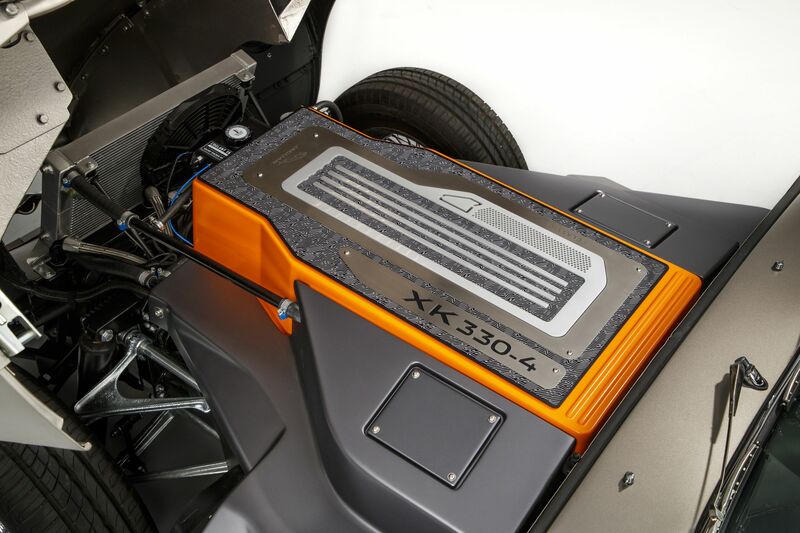 Two motors are used to power all four wheels of this crossover, as opposed to the single motor used to power the electric E-type’s rear wheels (via a rather conventional driveshaft and differential). Owners of existing E-types can opt to have their cars converted to battery power as well, and Jaguar advises this will be a completely reversible process to protect the originality (and perhaps, future value) of its cars. In addition to swapping out the engine and transmission, the electric E-types also receive a new instrument panel, LED headlamps, a new driveshaft, and, optionally, a center stack mounted infotainment display. We’ve been overwhelmed by the positive reaction to the Jaguar E-type Zero concept. Future-proofing the enjoyment of classic-car ownership is a major stepping stone for Jaguar Classic. 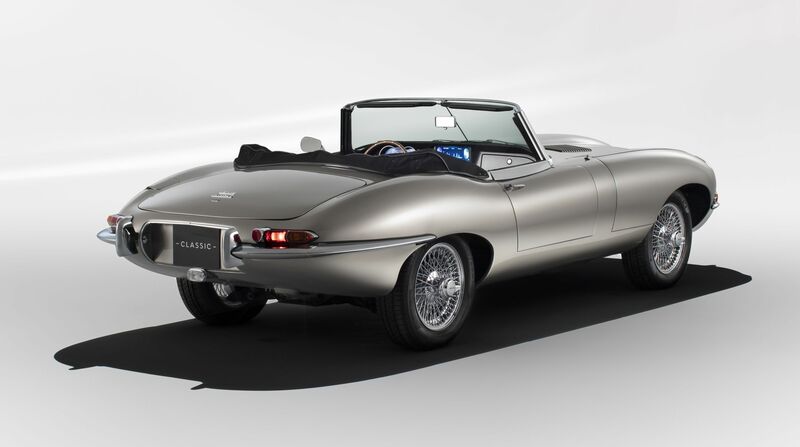 E-type Zero showcases the incredible heritage of the E-type, and the expertise and craftsmanship at Classic Works, while demonstrating Jaguar Land Rover’s dedication to creating zero emission vehicles across every part of the business, including Jaguar Classic. Jaguar has not yet announced pricing for its electric E-type or customer conversions but expects to begin deliveries in summer 2020. Those interested in reserving a spot in the queue are encouraged to email zero@jaguarlandrover.com, or to visit Jaguar.com/Classic.